Happy Thursday, everyone! I love a great running story. And when that story involves family? Even better! So when Jennalyn Jaeger, (who has the coolest name, right???) 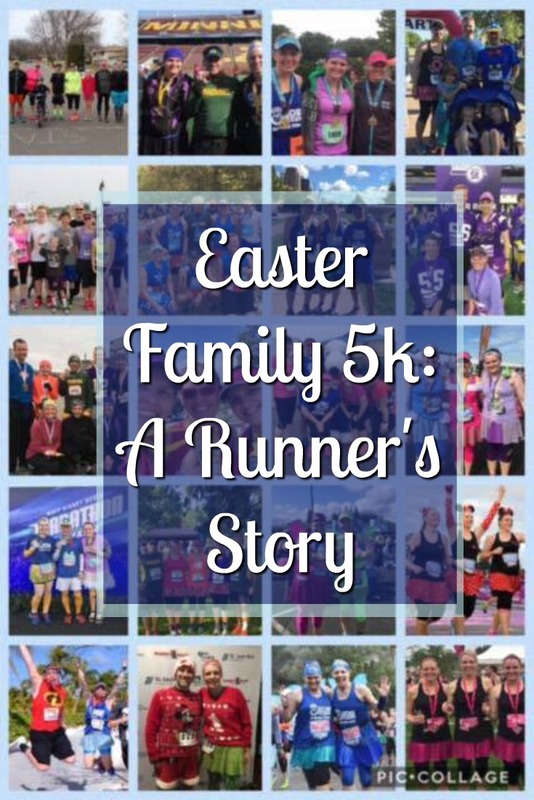 shared photos and the story behind her family’s yearly Easter 5k, I knew it belonged here at Joyful Miles. Jennalyn truly believes in the concept of enjoying life one mile at a time! So enjoy and if you, too, have a great story to share, send it our way! When I think about running, I think about family. I didn’t always feel that way. It’s something that has transformed over the past three years. Before that time, my perception of the sport was an activity I would always dislike and never have the endurance to do. It wasn’t until my fourth child was born and I turned forty-four-years-old that I even considered putting on a pair of running shoes and jogging around the one mile loop of my neighborhood. It all started with inspiration from my two sisters and a brother-in-law. 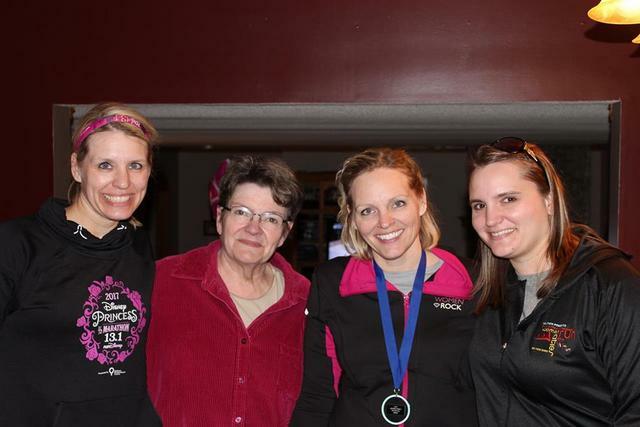 Around the time of my last pregnancy, my sisters and brother signed up for a local 5k. I could see their excitement after they ran the race and they proceeded to sign up for more and more events. Soon running became the topic of conversation at all the family get-togethers. Their new interest in running found my two sisters signing up for their first Disney race: 2014 Princess Half Marathon. Having a true love for Walt Disney World, I wasn’t about to let them travel to Florida without me. We flew south that February and I tagged along, experiencing the sites of the expo, surprised by the variety of people in unique running costumes, and feeling the buzz in the air from the excitement a Disney race weekend brings. As intriguing as this experience was, I still doubted that I, the person who hated to run, could ever complete 13.1 miles. When we returned home from the trip I found myself feeling sad as though I had missed out. It really hit me that my sisters and brother were having fun without me and the idea of running in Disney now seemed like something I considered placing on my Bucket list. I knew I didn’t want to continue feeling so left out and I knew it was up to me to change the situation. As I look back, I believe the hardest part about starting to run was putting on a pair of running shoes and walking out the door. Nevertheless, in August of that year, I did it. I pulled out an old pair of sneakers and started moving through my neighborhood, one mile out and one mile back. I stopped now and then, I moved very slow, and wondered if people in their yards were watching me. When I returned home, I felt good that I gave it a try. I was surprised, and maybe,,,,,,,, I could do this….. I attribute my running accomplishments to my family. They encouraged me to experience, learn and push beyond my doubts. Not only did they peak my interest, but they helped me realize the sport of running could be enjoyed in a different way then I had believed. I was introduced to interval running by my sister, Jill. My sister Annie taught me to run a pace based on how I feel-slower if it had been a hard day and faster if you feel invincible. I learned that wearing race shirts make me feel strong, and running gear is fun to buy. I learned that race medals are not just for winners but for participation! And they are really pretty on a display bar in my bedroom. I learned that running could bring me closer to other runners- people who run for causes and who believe in a healthier life style. 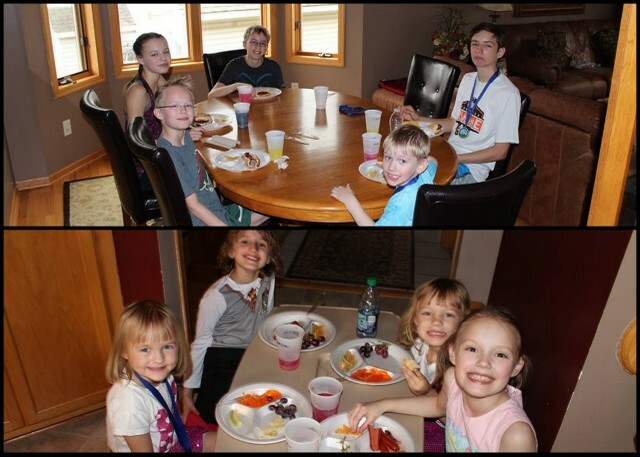 The most important lesson I learned about running is how much our family can enjoy this activity together. 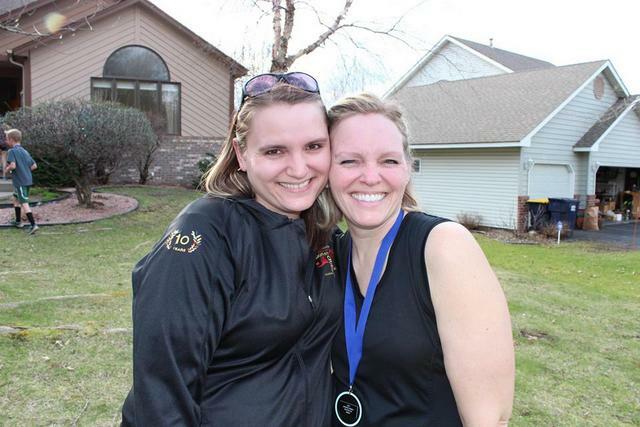 I’ve run multiple races with my sisters, brother-in-law, my children, and nieces and nephews. Turkey Trots at Thanksgiving, 5k’s on the 4th of July. We cheer each other on, sometimes aiming for personal records, but mostly to have fun. 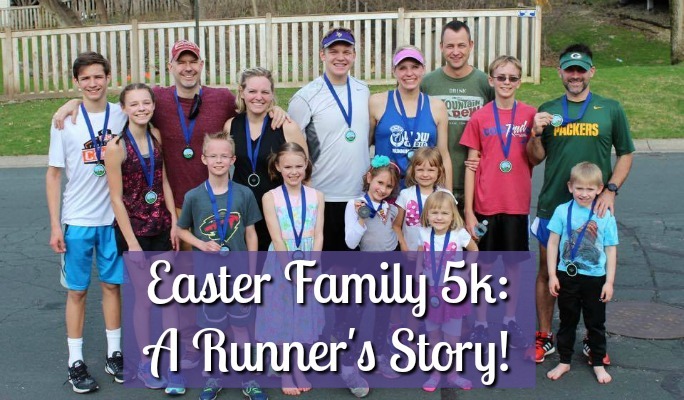 The best family run so far, is one created three years ago when my sister, Annie sent an invitation in the mail introducing the Easter Family 5k. We gathered at her home that Sunday to a homemade course mapped out in sidewalk chalk and soccer cones. 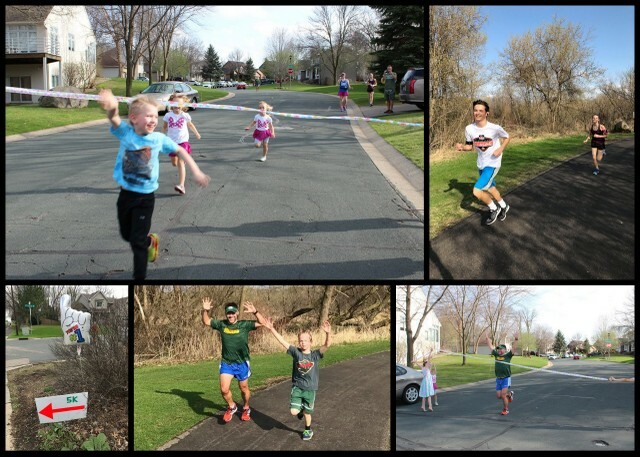 My husband kept time with his iPhone and the Kid’s Race took place on the city street in front of her house. The best part was her homemade medals made out of Dollar Store mini plastic tambourines and ribbon from the craft store. That Easter 5K could not have been any better- our whole family participated and we have those memories forever. 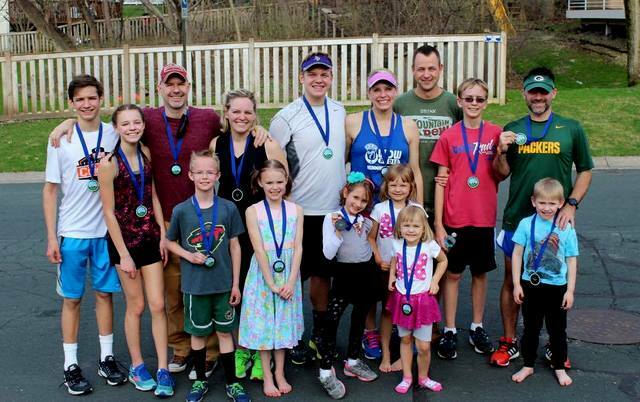 Our family decided the Easter 5k should continue as a tradition. My sister, Jill and her husband Donnie quickly volunteered to organize following year. 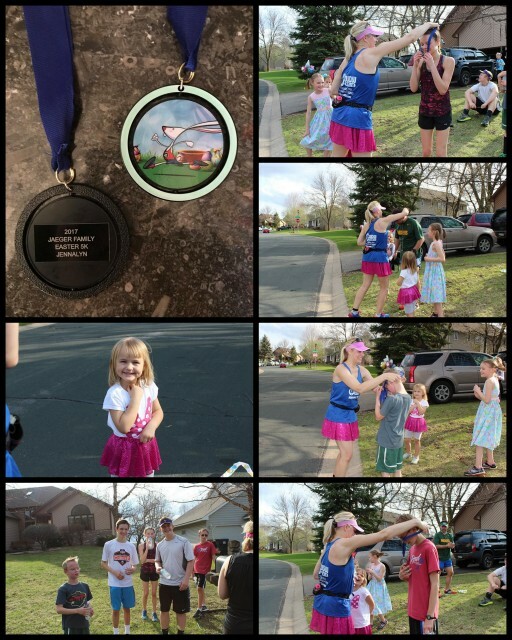 The 2016 Easter Family 5k didn’t disappoint and the highlight that year was for sure their creative medal made of a stuffed donuts with Mickey Mouse shaped donuts on the ribbon~ a real gem for Disney lovers. Well…as my story goes, I’m the last sibling to adopt this running thing and finally it was my turn to organize the Easter 5k. My medal wasn’t as creative as my sisters, but the spirit of our tradition lived on and I made sure everyone was a winner. How has running changed your life? Has running brought you closer to the ones you love? Hi! I’m a 46-year-old mother of four children ages sixteen, fifteen, six, and four. I’ve been a pediatric nurse for almost 25 years and I’m currently working in hospital management. Some might say I’m a Disney Superfan and I will admit I spend a lot of time planning my next trip to Disney World. I’ve always been active but running is new to me within the past three years. 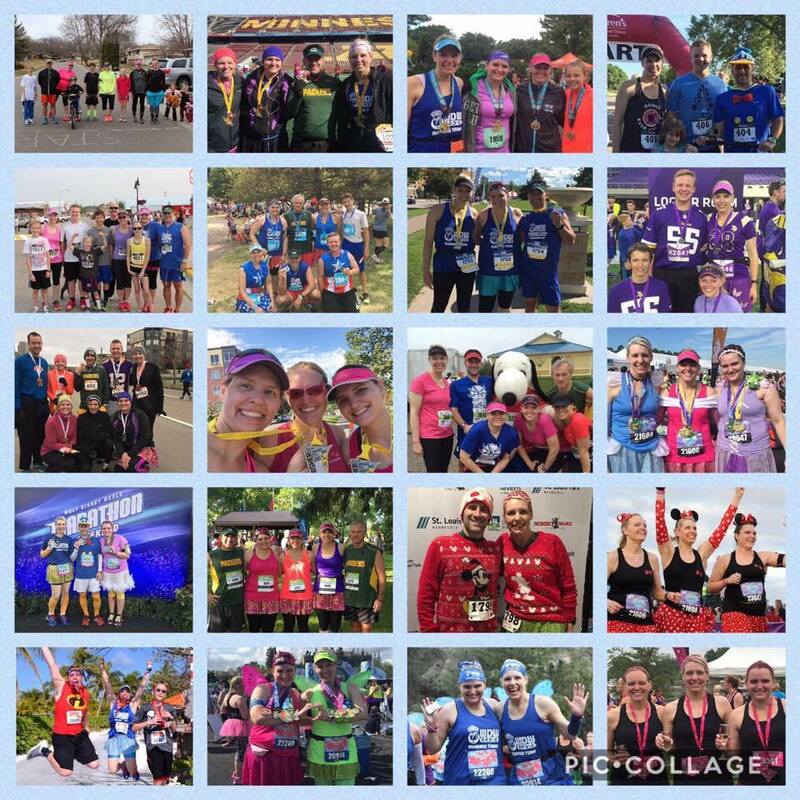 I believe the best part about being a runner is attending runDisney events and sharing those experiences with friends! I love diet coke and donuts and my hobby is taking oodles of pictures so I can use them to make online photo books of my family and our adventures!